Justine Clarke talks family and her true feelings for craft. 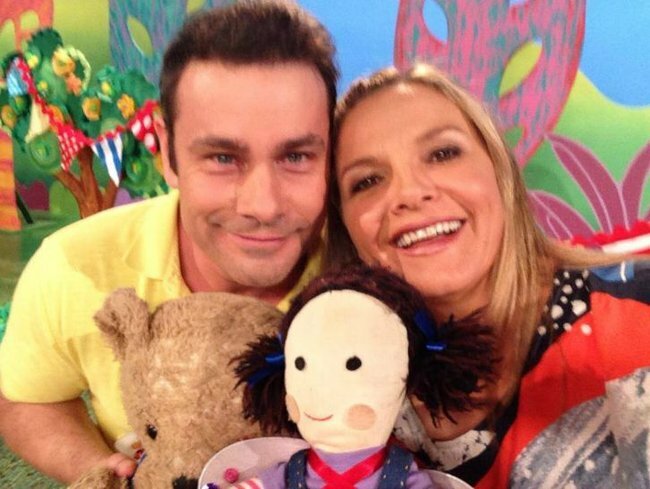 Play School host hates craft just as much as you do. She’s the Play School presenter loved by a generation of kids and parents. She’s sung to our children, read to them, and taught them to make things out of egg cartons. Even at home, with husband Jack Finsterer and their three kids, Justine is the “fun” parent. Justine loves playing with her kids. But she admits the amount of time she spends doing craft has “dropped off” with her youngest child, five-year-old Max. Justine and friends on Play School. Photo via Facebook. Justine and Jack, who is an actor, met while doing a play for the Sydney Theatre Company. Ever since the birth of their first child, they’ve been “juggling” their work commitments around each other. While Jack has appeared in shows like Life Support, Neighbours and Miss Fisher’s Murder Mysteries, Justine has been in Tangle, The Time Of Our Lives and, most recently, House Husbands. As well as that, she’s had Play School and her music career. “We’ve both been very conscious of trying to make sure that we can keep working but one person is always at home,” she explains. Justine says Jack has always been “enormously supportive” of her continuing to work. “He was desperate to be there and be feeding the baby and changing the baby’s nappy. Back then, too, there weren’t a lot of dads who were out with a pram." But like a lot of mums, she still struggles with the work/life balance. Here&apos;s a video of one of Justine&apos;s songs. Post continues after the video. Justine says having children – her older two are Josef, 14, and Nina, 12 – made her a lot more focused on her work, because she knew she had to provide for a family. As yet, none of the three children are showing any “burning desire” to follow in their parents’ footsteps and become performers. Justine also tries out all her songs on her kids – including the ones from her new album, Pyjama Jam! – even though Josef and Nina are well out of the target age range. Justine’s own acting career began when she was just seven. By the age of 12, she was appearing alongside Mel Gibson in Mad Max Beyond Thunderdome. She says it was an “interesting” childhood, and she learnt a lot. The advice she has for her children at this point in their lives is simple. Pyjama Jam! Album is released Oct 2 through ABC Music and Universal Music. Pre-orders through ABC Shops. Do your kids love Justine&apos;s music?